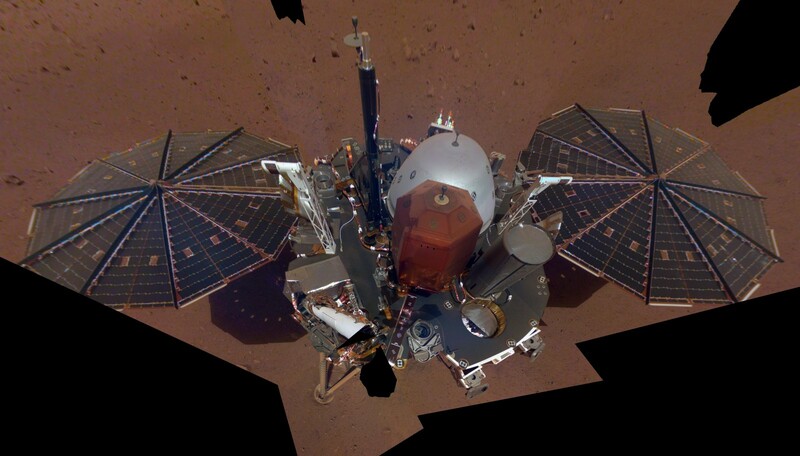 The InSight lander on Mars returned its first selfie, taken on the Red Planet December 6th. The vehicle took the photo using its robotic arm, and transmitted it to Earth as part of its first round of testing. The photo was a composite of 11 images taken by InSight. Accompanying the selfie was another photo, detailing the area immediately around the spacecraft, a “workspace” measuring four meters by two meters (14 by seven feet), in which Insight will carry out its mission. Mission engineers will examine the area, deciding where to place instruments carried by the intrepid spacecraft. Using Insight’s robotic arm, engineers will place a seismometer and heat-flow probe, both of which work best on level ground. Researchers are looking for spots to place these instruments which are free of rocks more than 1.3 centimeters (half an inch) above the surrounding terrain. “The near-absence of rocks, hills and holes means it’ll be extremely safe for our instruments. This might seem like a pretty plain piece of ground if it weren’t on Mars, but we’re glad to see that,” said Bruce Banerdt, InSight’s Principal Investigator on the InSight mission. Engineers from NASA and Jet Propulsion Laboratory (JPL) did their best to find a rock-free spot within Elysium Plantia on Mars. Their work went even better than planned, and the spacecraft set down on a region nearly free of any bumps or rocks. Seen in the selfie at the top of the vehicle are science instruments, weather sensor booms, and a UHF antenna. The French space agency CNES developed the seismometer, the Seismic Experiment Interior Structure, designed to listen for marsquakes and impacts. That instrument has already recorded the sound of winds on Mars. The Heat Flow and Physical Properties Probe was built by the German Aerospace Agency. That instrument will bore down five meters (16 feet) below the surface of Mars, in preparation for carrying out its measurements. Mars InSight touched down on the surface of Mars on November 26th, the eighth successful landing on the Red Planet for NASA out of nine attempts. Science operations are due to begin in March 2019, but the seismometer could be in place in the third week of December 2018. Even on Mars, selfies can be great fun!